In advance of his meetings with the Soviet leader, Nikita Khrushchev, Kennedy's advisors attempted to prepare the President for what would doubtless be a challenging event. By and large, his advisors agreed that Khrushchev would try to intimidate Kennedy. Their first meeting took place in Vienna at the residence of the US Ambassador to Austria in the early afternoon of June3, 1961. The meeting featured a spirited debate between Khrushchev and Kennedy about their respective economic systems. The atmosphere improved during lunch. However, when the two leaders took a stroll later in the garden, Khrushchev relentlessly attacked both Kennedy and the US economic system. Later in the day, Dave Powers commented to the President how calm he looked during Khrushchev's attacks. Kennedy responded: " What did you expect me to do... take off my shoe and hit him over the head with it? " The afternoon meetings were no better. Khrushchev continued his relentless attacks on Kennedy and American policies. That evening, a state dinner was held in the SchÃ¶nbrunn Palace. Later that evening Khrushchev stated to his aides: " He is very young not strong enough; too smart and too weak. " The second day's meeting centered on Berlin and Germany. Khrushchev insisted he would sign a peace agreement with Germany with or without US approval, and without regard for US rights in West Berlin. Kennedy made it clear to Khrushchev that signing a peace agreement with Germany was not a problem, but blocking Western rights could lead to war. When the formal meetings were over, Kennedy insisted on a short private meeting with Khrushchev. At that meeting, Khrushchev stated: " Force will be met by force. If the US wants war, that's its problem" . " It is up to the US to decide whether there will be war or peace. The decision to sign a peace treaty is firm and irrevocable, and the Soviet Union will sign it in December, if the US refuses an interim agreement. " Kennedy responded: " Then, Mr. Chairman, there will be a war. It will be a cold winter. " Kennedy left the meeting shocked to his core. He stated to James Reston immediately after the meeting that it was the " worst thing in my life" . Kennedy was convinced he could use his charm and work things out with Khrushchev. Now, after the meetings, he felt that war was a very real possibility. 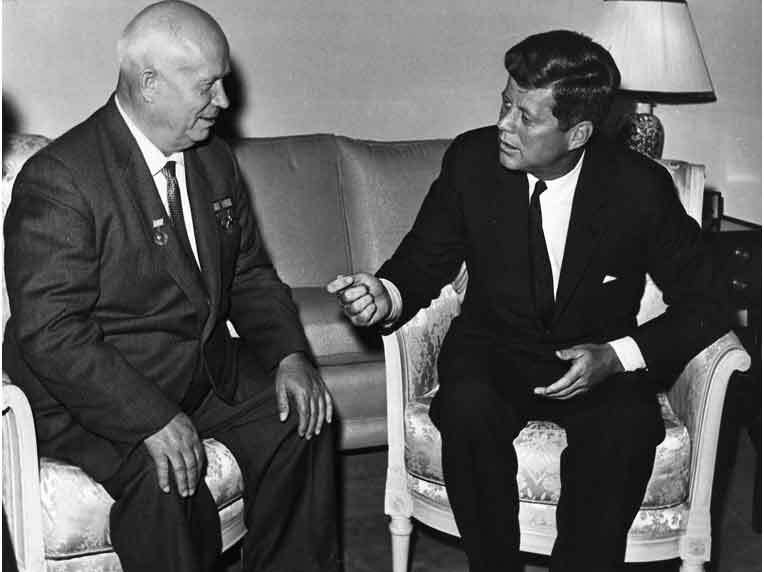 This encounter with Khrushchev forced Kennedy to rethink US policy throughout the world.